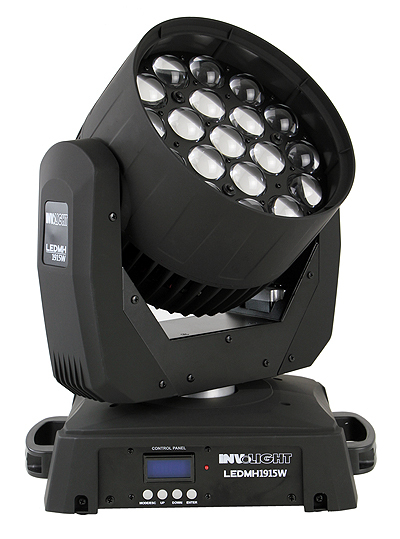 With the “LED MH720W” and its bigger brother, the “LED MH1915W”, INVOLIGHT offers two conceptually completely new moving heads, which are fundamentally different from “normal” washlights. Thanks to the 4-in-1 RGBW 15 Watt LED’s (LED MH720W – 20 Watt) not only an enormous brightness is possible, the LEDs also have a matrix control. So the possibilities are immensely larger. Chases and interesting color games are already created in the head and look impressive. Thanks to the motorized zoom function, the beam angle between 11 ° and 58 ° degrees can be set. Both devices feature world-class motors that enable extremely fast PAN and TILT movements. The operation is also professional: An LCD display with clearly understandable menu guidance makes all settings enormously easier. 2 different DMX modes are available to the user. A 14-channel mode for all standard applications as well as a 29-channel mode (LED MH720W) or a 34-channel mode (LED MH1915W) for complete control with impressive matrix functions. You just have to see this movinghead. In combination with the excellent build quality it is certainly one of the most interesting novelties on the market.